Yup, I actually purchased a watch with polished center links, and I think I love it. I have always been a professional series guy, buying well over a dozen Subs, SD'ers, GMT's and Explorer II's. I decided to go outside of my normal comfort zone and buy a Datejust II this time. I actually went to my AD thinking about a 114060, but since I did not love my 116610, it gave me some reservations. When I first saw this dial combo from the official pics at Basel a couple of years ago, I about fell out of my chair, I loved it. I have always been a big hand, lots of lume and lume dot kind of guy, so when I fell for this dial, I found it kind of odd. Everytime I have gone into my AD, I have always stared at this watch, but I never had the guts to buy it. We sized it yesterday and I walked around a bit trying to decide, I was so indecisive it was pathetic. I could not get over how comfortable it was on the wrist, perfect height, perfect weight, the clasp was centered perfectly on my anterior wrist, it was perfect. The grey dial is just amazing, I just love grey dialed watches. I had second thoughts for a couple of hours at my AD, yea, I was there a couple of hours. Thank goodness they know me and I have purchased many watches from them, or they probably would have tried to send me on my way. I think the smooth bezel DJ II's are really a darn near perfect sport watch. I think the fluted is more dress while the smooth gives it a more sporty look. 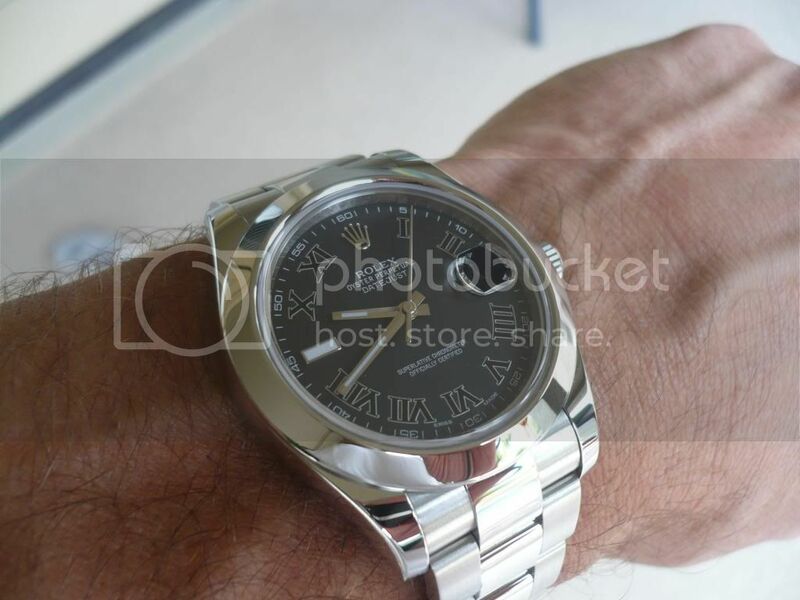 I figured, heck, I have owned many polished Panerai's, so why not a polished Rolex case. I have already taking it swimming and for a run, great watch. That was one of my reservations, I always buy divers because I live in my pool, well, the DJ II's is just as comfortable in the pool/ocean as my other divers. I will never go 330ft and as we all know, these DJ's could go well over that depth before any issues. Overall, I am pretty excited. I think I opened my eyes a bit yesterday and now have a watch that I will enjoy for many years. I think the DJ II's are a perfect daily wearer, there is nothing that this watch can't do, and it will look good doing it. Just look at how perfect they lay on the wrist. Amazing case design. Next Topic: Dressed up my SubC with leather!